Situated in the picturesque valley of the Gamka River, on the edge of the sleepy town of Calitzdorp, Die Krans was formally part of a larger property farmed by Chris and Danie Nel, whose grandfather had bought the farm in 1890. The first Nel to arrive in the region was named Louis. He took a 5,000 hectare farm in the area in 1760, renting from the Dutch East India Company. Legend has it that no rent was paid for the first seventeen years of his tenure. It’s not recorded as to whether he did pay the full amount eventually, but the Company allowed him to keep the farm anyway. Vineyards were first established in 1936 with brandy, sweet wines and sun-dried raisins being produced, primarily for export to Britain. Until then, their main source of income had been the raising of ostriches. The market for their feathers started in around 1880 and the Nel’s made a small fortune from this business over the next 25 years, until World War One curtailed such exports to Europe and the fashion finally ending by 1918. The farm was divided in 1980, with Chris and his son, Boets, retaining 33 hectares of Die Krans, while Danie and his son, Carel, settled on the subdivision which was registered under the name of Boplaas, thus allowing the two cousins to have more control over the eventual succession of the property. The present cellar was built in 1964 and, in 1979, Die Krans was the first farm in the Klein Karoo to be registered as an estate when they started to bottle their own wines. 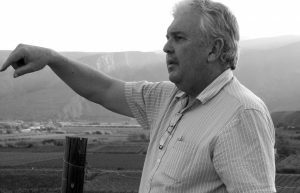 Boets took overall charge of the farm in 1981, after his father’s passing and today works in close collaboration with his viticulturalist brother, Stroebel and winemaker, Louis van der Riet who arrived on the farm in 2012. The name was only recently changed from Die Krans to De Krans. Winters here are cold, but spring and bud-break arrive early with the vintage a good week or so ahead of the rest of the Cape. Though summers are hot, the valley is less than 80 kilometres from the coast, with the prevailing south-west wind bringing some relief on summer afternoons. Rainfall is around 200mm per year, most of which falls during the two months following the harvest with the vineyards, therefore, needing to be irrigated. The soils on this fertile plain are a deep sandy loam. The range of wines produced in the cellar is large, but we have decided to concentrate on what Calitzdorp producers do best, which effectively means fortified and table wines made from Portuguese grape varieties. Our selection starts, however, with a low (8.5%) alcohol, slightly sparking Premium Muscato Perlé that carries around 40g/litre of residual sugar. It’s a blend of 80% Frontignan and 20% Alexandrie, with the latter being added as juice rather than wine. Bottled with around 2 bar of pressure to give it a gentle mousse, it is light, delicate with a sherbet-like freshness and is frankly dangerous stuff. 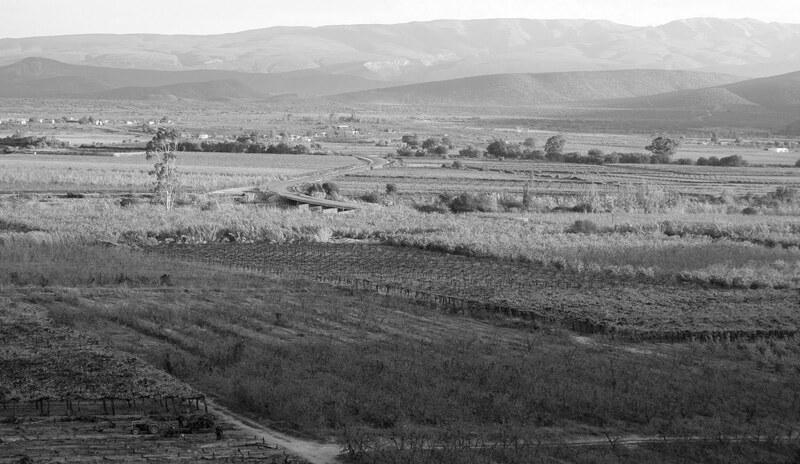 The ‘Tritonia’ is referred to locally as a ‘Calitzdorp Blend’ and is produced from 70% Touriga Nacional with Tinta Roriz, Tinta Barocca and Tinta Amarela. The white Muscat de Frontignan spends 36 hours on the skins before being fortified to 16%. It carries an impressive 250 g/litres of residual sugar. It offers incredible value. The Premium Cape Ruby is a blend of five varieties and is a multi-vintage blend (2013/14/15) and despite its modest handle is a very serious wine in its own right and also something of a bargain. The Cape Vintage Reserve is from 60% Nacional, 30% Barocca and 10% Roriz, all vinified apart. This 2013 is the 11th consecutive vintage to achieve a Platter Five Star rating. The Tawny is equally impressive. From the same three varieties, it’s a multi-vintage blend of wine aged in barrel for between four and ten years and is comparable to any Portuguese equivalent. The Cape Pink is a new style of fortified wine that can be served over ice, used as the base of a cocktail.